I used to have a life. That was before I started looking for an apartment in Tel Aviv. Now it is all about yad2, homeless.co.il, and similar websites of house haunting: hours of my life regularly vanishing on the web, hoping to spot a good opportunity (before others do – here is where my poor Hebrew reading skills cramp me – I miss my ulpan teacher!!! ). When you do happen to stumble on something promising, by the time you actually get there you’ll be number twenty on the queue, and on someone’s list. Most of the times, you can not even meet the owner: he/she will later scan through the list of name-profession-situation (because that table is what your fantastic persona is reduced to) and he/she will arbitrary decide on The Worthy One. But worthy of what? With a budget like mine, of max. 4.500 shekels (1.200 $), what you can aspire to is something between 30 to 65 square meters, depending mostly on the location. With these restrictions, and the fact that most of the houses in Tel Aviv are at least 30 years old and suffering heavily from the sea corrosion, not to mention poor building materials (I have seen asbestos panels sitting ominously on more than one rooftop), what you need in order to find a decent flat is ultimately a miracle. The price of real estate has not been affected by the global financial crisis. In the 2008 Mercer cost of living survey, Tel Aviv was ranked as the most expensive city in the Middle East and the 14th most expensive in the world. 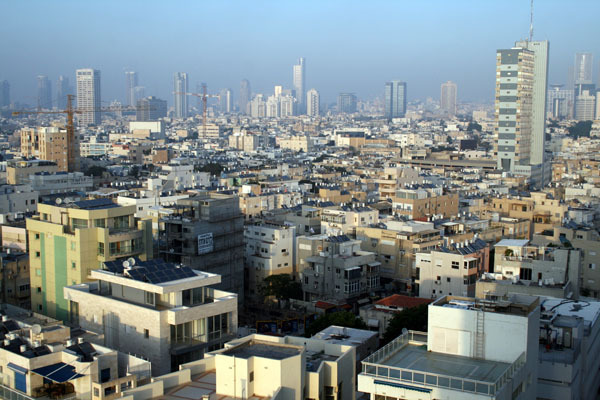 According to an article in the Haaretz dated 24/08/09, renting an apartment in Tel Aviv has never been so costly. The reason is that during recession, people who had wanted to buy apartments will prefer to continue renting, which pushes up the prices. One of the most frustrating aspects of looking for an apartment in Tel Aviv has been when I realized the existence of a wicked phenomenon called exchanging apartments. Let’s say you have been renting for a few years, and your lease is good because the price standards were lower a few years back, but you need some kind of upgrade (area, size, style of the flat, whatever). Instead of throwing yourself in the real estate waters, notably full of sharks, you will put your lease on rent with the magic words “dira le hachlafa” (= exchanging apartment only). Another lucky owner of a rent-controlled apartment will swap with you his fabulous lease, keeping the system safely closed to new entries. It is like a club: or you are in, enjoying the privileges, or you are out. I am out, and in urgent need of a miracle!